"This fabulous salad recipe is comparable to what is served in Japanese restaurants. It's vegan and tastes great! It goes well with traditional Japanese foods and also with American foods instead of coleslaw." Whisk together sesame oil, vinegar, garlic, ginger, sugar, salt, and pepper in a small bowl until the sugar has dissolved. 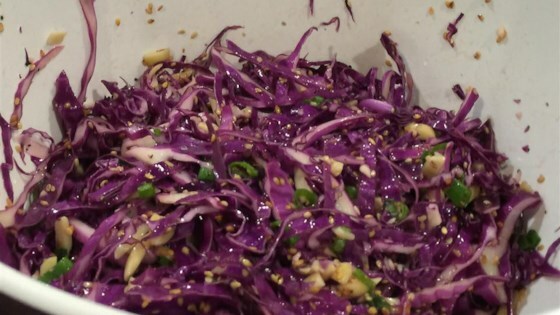 Toss the cabbage, green onions, almonds, and sesame seeds in a large bowl with the dressing until well coated. This flavorful, crunchy salad will be a hit at your next potluck. This recipe was a huge hit for a sushi party I threw recently. I did double the sauce as I found it a little light. Very tasty and is now added to my recipe box as a favorite. Thanks!